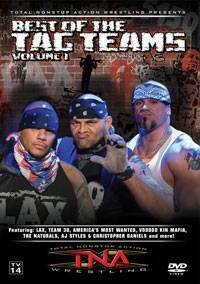 America's Most Wanted, Team 3D, The Latin American Exchange, AJ Styles & Christopher Daniels, The Naturals and Voodoo Kin Mafia - they are among the greatest tag teams in Total Nonstop Action Wrestling history! On this TNA home video release, you'll witness your favorite tandems fighting for control of the NWA World Tag Team Titles, one of the most prestigious championships in the history of the sport. Plus, many more matches featuring your favorite TNA Tag Teams!